This month we’re making brown bread!! I love brown bread!! When I was growing up, it didn’t occur to me that everyone didn’t know what brown bread is. We always had brown bread in the house for sandwiches and toast. It wasn’t until I travelled a little in the USA that I learned I had to ask for “wheat toast” if I wanted toast made with brown bread. This month the BBBabes have foregone dye and made actual brown bread. Great brown bread! Tanna has called it “Granary-style” bread. And apparently, this style of bread made with malted wheat flour is quite common in England. A number of friends have told me that when they buy bread they go for the type called ‘granary’ because it looks ‘more like the real thing’. Granary bread is made from a malted meal, and the ‘real’ look is achieved mainly by the addition of a scattering of whole cracked wheat grains in the meal mix. […] Granary is the proprietary name of a blend of wheatmeal, rye flour and pieces of malted grain, or sprouted wheat flakes as they are known the blenders. […] [G]ranary bread does inevitably vary from baker to baker, a circumstance which leads the public – as indeed it led me – to assume that granary bread was a generic term applied to any loaf made with malted meal and whole bits of wheat kernel. Granary’s unique taste and flavour comes from malting the wheat, which is slowly toasted and flaked over time, a tradition started by the Benedictine Monks of Burton Abbey. Wheat Flour (with added Calcium, Iron, Niacin, Thiamin), Granary Malted Wheat Flakes (17%), Wheat Bran, Flour Treatment Agent; Alpha-Amylase. 1 February 2015, 13:14 You want to make something “classic, simple, conservative”, Tanna? Count me in! But this malted flour isn’t at all common in Canada. And even if it had been once, it wouldn’t be any more, now that so many of our flour companies have been taken over by Smucker. But surely, I can make my own malted wheat flour…. I know I have seen wheat flakes but I don’t remember seeing malted wheat flakes. We have to make our quarterly trek up to the only supermarket that sells unbleached no-additives all-purpose flour soon and maybe the same company carries malted wheat flakes – even though they’re not listed on their website…. Malt syrup is also a little tricky to find here – or at least diastatic malt is tricky to find and I’m assuming that that is the kind of malt extract that is being called for. Or am I over-thinking again? Anyway, this sounds like great bread! After watching this delightful video, YouTube: Malting wheat at home, I have decided NOT to malt my own wheat. TOO hard!! Maybe I can find some malted wheat flakes at a home-brewing store…. Alas, I have had no luck finding malted wheat flakes. I really thought one of the health food stores would have it. I looked at this page talking about how to malt your own wheat: homebrewtalk.com Easy Wheat Malting and another: byo.com | Make your own malt. I might do it. Hahahahahaha Who am I kidding? I’ll more likely be lazy and just add some malt powder. It all depends on whether all this infernal snow melts so I can ride my bike to get organic wheat grains – so they’ll sprout. 12:24 I’m a freak. I know I’m a freak. But I just can’t bear the thought of measuring ingredients for bread without using a scale. I used the King Arthur Flour conversion chart to make the conversions. http://www.kingarthurflour.com/recipe/master-weight-chart.html Or rather, all but the salt are taken from the King Arthur Flour site. The USDA says that 1 teaspoon of tablesalt weighs 6 gm. I sure hope I can find wheat flakes somewhere! A question: is the barley malt extract a syrup or is it dry? (I assumed it was syrup when I was doing the conversions) …obviously, I know that it can be whatever I want it to be… I’m just curious about whether King Arthur Flour thinks malt extract is dry or syrup. The USDA says that 1 teaspoon of tablesalt weighs 6 gm. 9 March 2015, 18:53 I googled to see if there were any Home Brewing stores nearby and Bingo!! There is one that is about a 20 minute walk from our house. They sell liquid and dry malt extract. They also sell toasted wheat flakes as well as malted grains. Whoohooooo! This is just getting more and more fun! 12 March, 2015, 14:55 At the home brew store, they didn’t have malted wheat flakes, even though they had plain and toasted wheat flakes. I chose to get their malted wheat berries (“Wheat malt”) that they kindly coarsely ground for me at the shop. I think I’ll use part of the recipe to make a starter and add the wheat berries to that overnight mixture. Or should I just presoak them for an hour or so before I mix the dough? Hmmm. What to do. What to do…. But of course, the home brew store DID have barley malt galore. I got “Briess Golden Light Dry Malt Extract”. It took me ages to decide whether to get liquid or dry malt extract and in the end, I got dry, just because I couldn’t find the liquid malt extract on the shelves and was too embarrassed to ask the very nice fellow behind the counter, when he had JUST pointed it out to me on the wall…. There isn’t a major difference between liquid and dry malt except for the amount of water that is left in the end product. Because the two types of malt are different in water content, you cannot interchange the two in a recipe. You can however, use a simple formula for determining the conversion from one to the other. […] Conversion: The ratio for use between the dry and syrup forms of malt extract can be approximated as follows: 1 pound of dry malt extract would roughly equal 1.2 pounds of syrup malt extract. Likewise, 1 pound of syrup malt extract would roughly equal 0.8 pounds of dry malt extract. Basically, 1 tablespoon of dehydrated malt extract per 2 lb of flour is dissolved in 1/4 pint of boiling water, which is then made up with tepid water to the necessary amount for mixing the dough. And this neatly solves my problem completely. Many many many thanks to our brilliant Tanna! I’m planning to make the bread tomorrow and now I think I’ll add a tiny bit of rye flour too. 12 March 2015, 23:55 I decided to split the recipe into a starter/dough and let the malted wheat berries ferment overnight. I dumped the wheat into the bowl and was a little disappointed that it didn’t really smell like anything at all. I thought that malted wheat would pack a punch! Then I poured boiling water overtop. Whoa!!! It DOES pack a punch. Wow, that’s pretty funky! I let it cool before adding 100% whole wheat flour as well as 2 gm of yeast. And then because Elizabeth David mentioned that Granary flour often had a some rye in it, I threw in a little. Why not? It will be really interesting to see what it smells like tomorrow morning. 13 March 2015, 09:31 Cool! It wasn’t quite as funky this morning and it had puffed out amazingly – almost like a gel. Mixing and kneading in the rest of the ingredients was easy and it’s now in the oven with only the light turned on. It smells completely different from our usual bread but has a wonderful grainy fragrance. Ooops!!! I completely forgot to reconstitute the malt powder in boiling water. Next time…. 16:04 The dough was ready to shape a couple of hours ago but I wasn’t ready to shape it. So I pushed it down to rise again to be ready when I was ready. It’s now shaped (3 loaves instead of 1 giant one). I wonder if I should have made just two loaves…. T wanted to shape one of the loaves and to experiment with the covering as they rose. He has a theory that the outer shell should dry a little. Even though I want to, I’m not going to argue. In general, T is the one who doesn’t make mistakes in the kitchen. We covered all three loaves with a tea towel but only two (the ones I shaped) with a plastic grocery bag overtop. 18:38 Rats! I really don’t have the right temperment for bread making! Yup, I forgot to check to see if it was ready to bake. I fear that it has overrisen. The loaves have split. Or rather, my loaves that were covered with teatowel AND plastic bag have split. I used the lame on them anyway. On one of the loaves, I extended the depth of the split and on the other I put two new slashes. T decreed that the 3rd loaf wasn’t ready to go in the oven. And we agreed that one of the loaves was all his…. 18:38 Yes. I remembered to set the timer. I can’t wait until tomorrow to taste the bread! We reheated a loaf and then cut the heel in half to taste the bread as is. It’s delicious! A little malty but really delicious. And then we toasted some slices to go with breakfast. Oh oh oh! We loved it! I was in heaven. At last, real brown bread! starter: In the evening of the day before you will be baking the bread, put the malted wheat into a largish bowl. Pour boiling water overtop, stir, and set aside to cool. Try not to freak out that it’s smells quite pungent. When the malted wheat is cool enough that you can easily put a little against the back of your wrist, add the whole wheat and rye flours. In a small bowl, whisk yeast and water together until the yeast has dissolved. Add this to the malted wheat and flour mixture and stir with a wooden spoon 100 times. (Why 100 times? It just seems like a nice even number and will ensure that there are no lumps.) Cover the bowl with a plate and put it in the oven with only the light turned on. Leave it there over night. mixing the dough: Whisk dried malt extract, yeast and warm water together in a small bowl until the yeast has dissolved and set aside briefly. Put oil, all-purpose flour and salt on top of the starter. Wish that you had remembered to add a little ground flax seed and decide you’ll remember to add it next time. Using a wooden spoon, stir everything together. Kneading Use your hands to knead the dough in the bowl. Knead it well for about 10 minutes until the dough is really smooth and completely unsticky. As you knead, use the dough to clean the sides of the bowl as best you can. Pretend that you didn’t notice the instruction to “Turn the dough out onto a lightly floured or lightly greased work surface, and knead until it’s cohesive. Give it a rest while you clean out and lightly oil your bowl”. When the dough is kneaded, simply cover the bowl with a plate and put it in the oven with only the light turned on until it has doubled in size. If it doubles in size a little too early for your schedule, give the dough a couple of turns to deflate it. baking When the bread has risen, remove it from the oven and put it on the counter. Make sure that there is a stone on the middle shelf of the oven and turn it to 400F. 1.) Wholegrain Flour The BBB recipe calls for “100% White Whole Wheat Flour”. I decided to use mostly 100% “no additives” whole wheat flour and a small amount of dark rye flour. 2.) Water The BBB recipe calls for “warm water”. And you know what I’m going to say about the water, don’t you? I cannot help myself from repeating it over and over: please do not use water from the hot water tap. Instead, heat the water in a kettle or microwave. If you are allergic to using a thermometer, you can check the temperature by putting a few drops of water onto your wrist: if it feels warm, it’s too warm; if it feels cool, it’s too cool; if it feels like nothing, then it’s fine. Please note that before the yeast is added, the liquid temperature must be BELOW 120F (49C) because yeast begins to die when the temperature is higher than 120F. 3.) Malt Extract The BBB recipe simply calls for calls for “malt extract” and doesn’t specify whether it is liquid or dry. I had intended to reconstitute the dry barley malt extract we got with boiling water, but forgot (heh, there’s a big surprise…). Next time! [D]ehydrated malt extract […] is dissolved in 1/4 pint of boiling water, which is then made up with tepid water to the necessary amount for mixing the dough. 4.) But I LIKE warm bread just out of the oven!! N.B. Of course you will want to serve warm bread. Reheat it after it has cooled completely. (It is still baking when first out of the oven!) To reheat any UNsliced bread, turn the oven to 450F for 5 minutes or so. Turn the oven OFF. Put the bread in the hot oven for ten minutes. We LOVE this bread! It’s fabulous toasted. We pretty much demolished one loaf for breakfast on Saturday. And we had another loaf (maybe not all of it, but there’s not much left…) with baked beans and steamed broccoli for dinner last night. This recipe is a keeper! And I’m definitely going to be adding some malted wheat to our everyday bread as well, from now on. Many thanks for a great recipe, Tanna! I always dreaded those essay exams at university and in graduate school. Gad, you really had to know your stuff. […] Now, contrast that with how things work in the sandbox. When kids play in a sandbox, they have fun, they experiment and they learn. That learning can some times move into unexpected areas. And to think that I had forgotten how much fun it is to play in the sandbox. Quick! Get your shovel and pail. You must join us! Because we know you’ll want to make granary style loaf too. To receive a Baking Buddy Badge to display on your site: make the bread in the next couple of weeks and post about it (we love to see how your bread turns out AND hear what you think about it – what you didn’t like and/or what you liked) before the 29 March 2015. If you do not have a blog, no problem; you can also post your picture(s) to Flickr (or any other photo sharing site) and record your thoughts about the bread there. Please remember to email the Kitchen of the Month to say that your post is up. Please note that it’s not enough to post about your bread in the Facebook group. Because of the ephemeral nature of Facebook’s posts, your FB post may be lost in the shuffle. Please make sure to directly contact the kitchen of the month if you want to be included in the BBBuddy roundup. furry black fiend neeeeeeeds to see what is new…. This entry was posted in baking, BBBabes, bread - yeasted & unyeasted, bread recipe, food & drink, posts with recipes on Monday, 16 March 2015 by ejm. I absolutely loved this bread, too. 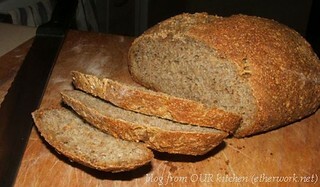 I read that granary flour is often used in Irish brown breads, too (which makes sense…). And you make me giggle by saying you, a Babe, doesn’t have the right temperament for bread baking. Pssshhh. Lovely loaves, I love your free form! Your bread looks fantastic, airy and brown, great baking. How clever to find a brewery that has these things, although this malted wheat looks very different from my malted wheat flakes in colour. and I’m able to comment here… progress!! What a cute story Elizabeth! Your brown bread looks great! I bet it tastes just as good. I’m so glad you can get comments now. Happy Baking! I failed to hear the trumpets announce that comments were back! Whatever the slash, I think your breads look marvelous and if you like it wildly, I shouldn’t worry about how the slash went. Didn’t you love E David’s talk about cod liver oil mixed with barley syrup and so she toned the malt flavor down? I didn’t find the malt barley strong in this at all. I tried the Malted Wheat Flake Bread ( http://www.kingarthurflour.com/recipes/malted-wheat-flake-bread-recipe ) on KAF and we really loved it, even more than the previously two bakes. I like that it has an overnight soak. You think maybe we should trust ourselves to play in the sandbox more often? Yes! As long as we don’t start throwing the sand around too much. Did Elizabeth David actually say “cod liver oil” too, Tanna? If so, no WONDER she doesn’t really like the taste of malt! is it time to eat yet? ?